5 | 241 students enrolled. Certification in Online Finance for Non-Finance Managers course is jointly certified by NSE Academy & Elearnmarkets (NSE Academy is a subsidiary of National Stock Exchange of India). This course which gives an understanding of basic accounting and financial concepts and ability to assimilate the financial information of an organization. The aim here is to equip you with a roadmap and framework for how financial professional makes decisions. Every business opportunity needs to be analyzed and viewed with a financial lens in terms of profits & risks associated and the impact it has on the company’s financial statements. This programme focuses on these financial jargons and concepts which is a requisite in the corporate world. The non-finance executives can thus add a lot of value to their profile by being conversant with the essential principles of finance so that they are not only able to comprehend the financial jargons but are also able to relate their output to them. Students enrolling for this programme will be given a “Certificate of Participation” from NSE Academy facilitated by Elearnmarkets.com, after successful completion of the course. He shall also be given free access to related webinars conducted by Kredent Academy for further knowledge enhancement. An email query support, Question & Answer community platform will also be availed by the student for any kind of doubt clearance related to content while pursuing the course. Various practical applications of interest rate. Concepts of time value of money. 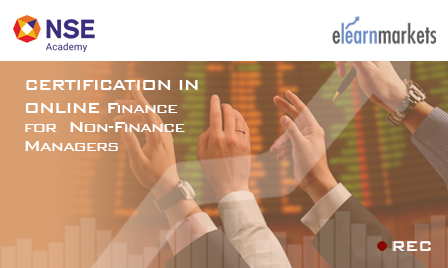 Certification in Online Finance for Non-Finance Managers is useful for fresher, managers and professionals of diversified fields who would like to get introduced to the basic finance terminologies and concepts. It provides knowledge fortification & exposure to practical application, serving as an effective resume builder and ideal preparation for the current and future career.